If you have a 2-4 year old computer it may be nearing the point where it could feel sluggish especially if you compare it to new computers. Buying a new computer is a pretty hefty expense and will run you at least a few hundred dollars. If your computer is not too old then you might be able to effectively extend its life some with an upgrade or two. Generally the best computer upgrade as far as price / performance is to add new system memory. Memory is fairly cheap and adding more memory will help your computer operate better. Doubling your memory size could boost your performance by up to 25-50% in some applications and significantly speed up your system when you have multiple applications running. Of course I wouldn't recommend throwing money at your computer just because. But if you're on the edge of buying a new system and either can't afford it or if you just want to milk a bit more life out of the system then a memory upgrade is likely a good option. When it makes sense to upgrade memory. First don't throw money at a very old computer. If your computer is in the neighborhood of 1-4 years old then upgrading the memory might be a good option. If the computer is older than 4 years then it may be getting too obsolete for it to be cost effective to do upgrades. I wouldn't continue to throw money into upgrades on a very old computer and at some point I'd consider buying a whole new system. As a basic rule of thumb, I'd say if you are running Windows XP or Vista and you have less than 1GB of memory then an upgrade would be a good idea. You can get 2GB of memory for around $25-$50. Upgrading to 2 GB or even 3 or 4 GB would be a good idea. (see comment below bout memory limits for XP 32 bit). If you already have 2-4GB installed then an upgrade probably won't get you much. Adding memory to a computer is relatively easy upgrade. If you can do it yourself then great, if not then you'll need to seek out help or pay someone. To install system memory generally all you have to do is power down the system, open the box, pop out the old parts, insert the new memory, close up the system and power up. See the DIMM install guide at Crucial.com for basic process. Installing the memory itself is not hard at all and the parts go into a socket that snaps right in place. I won't go into too much detail here about the process to install memory. I'd recommend you find and read the system documentation for your computer. It should give you step by step process to install memory. But keep in mind that you should be careful with computer components and follow all the safety precautions in your documentation. If you are not comfortable doing an upgrade on your own then consider getting help from a friend. Most of us will know a friend or relative who knows their way around the inside of a computer. You could also take your system into a local computer shop or a Geek Squad location and get them to install the memory. Geek Squad charges $40 to install memory. Of course spending another $40 to have someone do it will probably about double your costs so that makes the upgrade that less cost effective. First thing to do is identify the type of memory your computer uses. Your computers documentation will probably tell you. Common memory types are named something like : DDR2 PC2-6400 or DDR2 667. 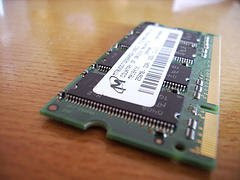 DDR2 is the the type of memory. The numbers like 667 or PC2-6400 designate the speed. One easy way to identify your memory upgrade is to go to the Crucial memory site then use their 'scan my system' option on the front page. This will download a small program that will try to determine what computer model you have and how much memory you currently have. It will then give a recommendation for a potential memory upgrade. Memory is something I wouldn't cheap out on with a generic product. This is one of the most important things about up grading memory and a lesson I've learned through over 12 years of professional experience working with computer hardware. No name or generic memory is usually cheaper because they cut corners or lack quality controls. Look for a good brand name when buying memory. I recommend Crucial memory from Micron. Its good memory at a reasonable price. I've used Crucial / Micron for years and I've never had a problem with them. I recommend shopping direct at Crucial.com or via Newegg.com. Make sure the DIMM is made by the brand in question, rather than just a DIMM with Micron chips on it. The DIMM should be made by Crucial. There are many other good memory brands out there as well and you may do well with others. Thatever brand you use, most important point is to avoid the cheapo generic parts. No need to spend a lot extra for super fast memory. If you shop around for memory you'll see some models that are more expensive. They might have 2 different parts that are 1GB in size and one will cost nearly double the other. The difference in those parts may be that the "CL" or cache latency is lower on the higher priced item. The lower the cache latency, the more responsive the memory will be. For most users it is not worth it to spend more to get faster cache latency. The actual system level performance will not be considerably better. If your system supports multiple frequency speeds of memory then the added benefit you would get from going with the faster parts is also not necessarily worth extra cost. I wouldn't spend a high premium to get high frequency memory either. If its a couple bucks extra then why not, but don't spend 25% or more premium for faster speeds thinking that 800MHz will be much faster than 533 Mhz memory. If your computer is a bit old then the format of memory it uses may be obsolete. In this case the cost of the old memory may be significantly more than the cost of the new format of memory. This may seem odd since the old technology is worse yet costs more. But the reason is simple supply and demand. Since there is very little demand for the old parts they end up costing a lot more. If your computer is fairly old and you notice the memory upgrades cost much more than $50 then don't bother. If you are running Windows XP 32 bit then it will not be able to see more than 3 or 3.5 GB of memory. The exact limit will depend on the system design but its in that vicinity. So knowing this, going from 2GB to 4GB may not get you as much as an improvement as you'd expect since you may be maxing out at 3GB. If you are running Windows XP 32 bit then you might consider sticking to 3GB or lower. Here is a Microsoft site about identifying if you have 32 or 64bit version of XP. A memory upgrade is generally the best return on investment as far as computer upgrades. If you do the work yourself spending $25 or so to get a couple 2GB parts is well worth the cost and can extend the effective useful life of your computer for a while. General guide to memory upgrades. Upgrade or Buy a New PC from PC World. Article is a few years old but principles remain the same.